When is a Feather a Durability Risk? There have been multiple forum discussions about feathers and durability. 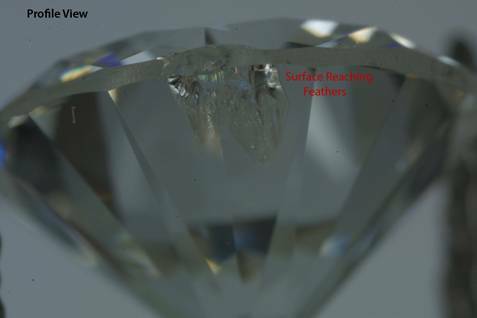 In an effort to alleviate Pricescope poster concerns, we have asked several participating diamond experts to answer the question, “when is a feather a durability risk?” Before we delve into their responses, let’s first take a look at the nature of feather inclusions. When examining your diamond for feather inclusions, remember that your diamond has completed a tumultuous and incredible journey. Before a diamond reaches the hands of a retailer, it has endured intense heat and pressure, as well as a highly abrasive production process, to achieve its characteristic sparkle and brilliance. Diamonds are formed in the earth’s upper mantle and forced to the earth’s surface by a violent geological process called “emplacement,” in which diamonds and other minerals are transported via host rock. The majority are mined in large-scale open pit operations that move massive amounts of earth to locate a single diamond crystal. Diamonds are also mined from alluvial deposits, after surviving centuries of tumbling in ancient riverbeds. If diamonds survive the mining process, the rough goes to a manufacturing house to be sawed or cleaved, bruted, polished, and—finally—boiled in acid to remove any remaining grit. It’s a rough process for a little piece of carbon. A feather is a general term for any type of fissure within a diamond. Feathers were most likely created when the diamond was formed billions of years ago, or when it was pushed to the earth’s surface. So if a diamond with a feather inclusion has survived formation, emplacement, mining, and faceting, it is questionable that an included feather will cause a future durability risk. Feathers can be found in stones ranging from VVS1 to I3. When looking at feathers, pay attention to their size and position. Generally, if a feather does not create an opening on the surface of the stone, if it does not reach the girdle edge, or if it does not connect to other feathers near the surface, then it should not be a durability issue. If you have concerns about feathers within your diamond, then it is wise to seek the input of a qualified independent appraiser. Feather inclusions should be examined on an individual basis. How to Spot a Feather Inclusion? Feather inclusions typically have a feathery appearance and can be highly reflective, colored, white, or transparent. Individual feathers can be difficult to spot, because they may look different from various viewing angles. If you have an accompanying laboratory report, you can locate feathers by consulting the clarity plot. If your stone is not certified, then thoroughly examine the diamond with a loupe from different angles to find undocumented feathers. It is helpful to turn the stone back and forth, because some feathers can appear transparent from one angle while being obvious from another direction. 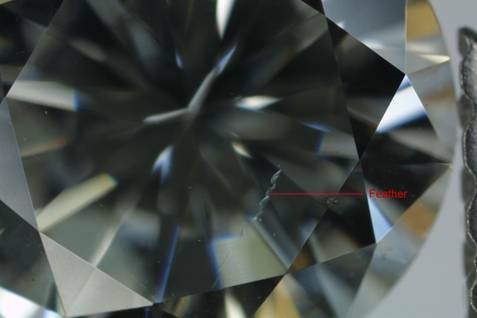 The following four photos show feather inclusions in a GIA graded I1 clarity diamond. Feathers aside, diamonds are not impervious to chipping or breaking. They are the hardest natural substance, which makes them extremely resistant to scratching, but they also have “perfect cleavage” in four directions. A cleavage plane is an internal direction of weakness, and gems with perfect cleavage can be split along those planes. Cleavage is often seen as a flat, clean break. Diamond cutters sometimes use cleavage to divide rough before faceting. Before the invention of the rotary saw, cleaving was the only practiced method used to divide rough during the planning process. It takes a dexterous cleaver to strike the diamond along the right plane to create a clean split. 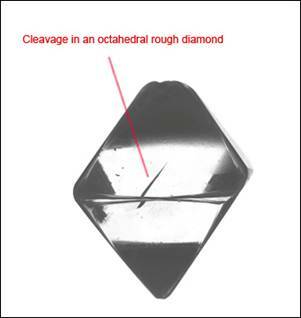 The photo below shows a rough diamond crystal with a fissure along a cleavage plane. Remember that diamonds can be damaged regardless of feather inclusions. Pointed corners of princess, pear, marquise, and heart cuts are prone to chipping, and extremely thin girdles pose the same risk. It is wise to wear your diamonds with care, and insure them for peace of mind. Can a feather result from impact? After surviving the cutting process, it is unlikely that a feather will worsen after years of normal wear. Feathers caused by impact are generally different from typical feather inclusions. 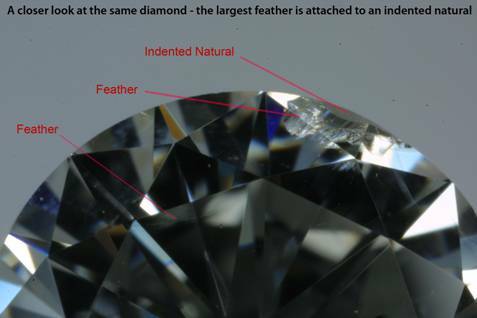 For example, if a feather is located on a cleavage plane, then the feather can extend as a result of impact, but this is rarely seen in fully faceted diamonds. If the diamond is going to split as a result of cleavage, it will split during the cutting process. 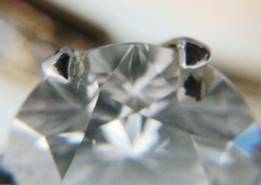 Considering the harsh nature of diamond cutting, is unlikely that a fully faceted diamond will have durability issues from cleavage during normal wear. Cleavage is an uncommon clarity characteristic. Other types of feathers caused by impact are “bruises” and “bearding.” A bruise is a miniscule network of tiny feathers often found on crown facet junctions, as a result of impact. Bearding is feathering along the girdle that results from incorrect handling during the bruting portion of the cutting process. A bearded girdle has a fuzzy appearance, but under magnification, the “fuzz” is actually multitudes of tiny feathers. With the advent of automated bruting, bearding is rarely seen today. A bearded girdle should not be confused with a “bruted” or frosted girdle. A bearded girdle negatively affects the appearance of a polished diamond. A bruted girdle is carefully finished, and it is not a clarity characteristic. If a feather reaches the girdle edge, it can be concealed by placing a prong near the feather. This should be judged on a case-by-case basis, because certain feathers may or may not benefit from this type of prong placement. The photos below show a safe way to conceal feather inclusions. The dark inclusion is a crystal associated with the feather that the prong is helping conceal. In this case, the prong was placed just left of the feather. Placing a prong directly on top of a feather increases the risk that the stone will break from the pressure of setting the prong or direct contact with the prong during normal wear. However, placing a prong near a feather provides a reasonable amount of protection. 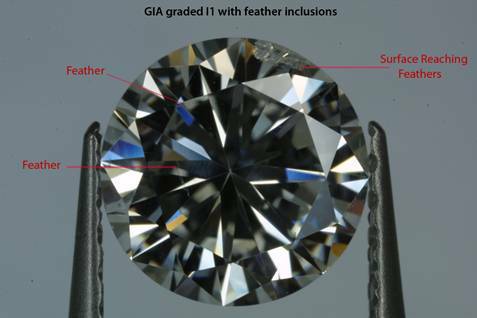 GIA clarity graders use the feather symbol to plot feathers that are close to the surface (extend from the surface into the stone) without breaking the surface. Feathers that break the surface by creating an opening are plotted as “cavities.” If a feather is included and does not reach the surface, it is plotted as an “included crystal.” While the plotted crystal inclusion may actually be a fissure within the stone, if it does not reach the surface, the grader will not plot it as a feather. Now that the basic elements of feathers are understood, please read the expert responses below. There is a great element of subjectivity concerning feathers and their potential for durability issues. 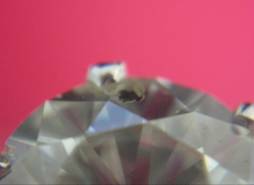 Each diamond expert has contributed examples that should help alleviate your concerns about feather inclusions. If you are still concerned about feathers within your diamond, please seek the assistance of a qualified independent appraiser. When is a feather a durability issue? A feather in itself is not a durability issue. A feather is just one of many names given to inclusions in diamonds. Sometimes a feather is totally innocuous and small although it can be a large and dangerous inclusion. The word "feather" alone means very little in describing durability. What one must look out with feathers in locations and sizes such as might have an effect in creating a weakness in the crystal structure of the diamond so that further opening or breakage might occur. When a feather creates an open fissure through the girdle, near a thin zone, near a pointed tip or sharp corner, there is increased potential for damage or breakage. A large, open feather in the crown or table can be increased in size, thereby lowering the clarity grade and could even lead to total breakage. This is rare, but all damage in diamonds is reasonably a rare event. Durability issues primarily associate themselves with already existing chips, fractures, extremely thin to very thin girdles, cleavages, very shallow crown angles, sharp corners, shallow pointed tips. It used to include pointed culets, but do to mounting style changes, pointy culets hardly ever become damaged in modern settings. On a secondary level, feathers which break the surface and crystals which break the surface are also somewhat problematic, but not on the level of the primary causes of further or increased damage. Anything which is declared as "open" may effect durability. Durability can be impacted by internal strain only visible with a polariscope. Again, not a major problem, but one which exists on the fringes. -No two feathers are alike. -In many cases it is internal and poses no real durability issue. if there was a well placed blow to the diamond. -But, a feather should be analyzed on a case by case basis with more scrutiny if a surface reaching feather is involved. -The size, location, and position will also help to determine potential durability issues. -But generally speaking, internal feathers are not usually cause for concern. I don’t look at feathers specifically as a durability issue. True, diamonds are the hardest substance on earth but at the same time they are extremely fragile and don’t need feathers to break or chip. In my almost 30 yrs of experience, I have never seen or witnessed a feather extend in size due to normal wear & tear. Yes, feathers can extend during the cutting process. I just had to tackle an issue of this sort on one of my recent diamond cutting processes. But, as a cutter, I have a few options to avoid these unwanted situations or at least use my expertise to save/limit from economic disaster. There are several options/positions in which I as a cutter will place the Diamond on the cutting wheel applying a correct direction and pressure not to aggravate the existing feather, but sometimes the feather has plans of its own. Also, cleavages as inclusions were present prior to the cutting process, so if it survived the process, chances are it will stay put no matter the clarity grade it earns. Secondly, as a cleaver, (my initial studies & apprenticeship in the cutting process was learning how to hand-cleave & plan Diamonds for production) I can assure you that it is not an easy task to aim and cleave at a specific cleavage plane identified by a straight feather. Many times while attempting to cleave (split) a diamond on an existing feather-cleavage plane, the outcome was a nice smooth split on a parallel plane resulting in the original feather still intact on one of the two parts. I know there has been a lot of discussion among Pricescope consumers regarding feathers and their effect on durability. I’ve seen some posters say "Why take a chance, just eliminate any stone with feathers when considering possibilities.” As a gemologist, this makes me cringe, as I know a feather is a typical diamond inclusion, of no threat unless it approaches the I2 category, and maybe not even then. It is only the I2 category (determined by feathers) that I begin to think of the feather as being a threat to the durability of the diamond. And indeed, this is one of the characteristics of the I2 category (established by GIA), where they tell the grader to consider possible durability issues. I personally don’t see many durability issues in diamonds assigned clarity grade I1 and above. I myself would not hesitate to purchase a good looking diamond with an I1 clarity assigned because of feathers. I know that diamond would probably go through several lifetimes of wear and tear with no further problems. This in particular because that diamond has already gone through the incredibly rigorous process of grinding, recutting and repolishing. If you wanted to be ultra-conservative in your clarity selection of diamonds with no possible durability issues, then I would advise SI1 clarity or better. Then you totally eliminate the fear of a feather possibly affecting the durability of your diamond. But in the same breath, I will tell you that you will eliminate a lot of SI2’s and I1’s that are simply gorgeous with no possible threats of durability, and great stones for the money. I myself wouldn’t hesitate to wear a great looking I1 (feather based) clarity stone. Each feather has to be looked at and the durability decided on a case by case basis. A very large feather can pose no threat to durability but position of the feather can make a smaller feather a problem. We’re particularly concerned with feathers that reach the girdle edge while also touching two other surfaces. Also, feathers that extend more than halfway through the stone in both the vertical and horizontal (or on any two planes). Since most diamonds have feathers of one sort or another, and since most diamonds never break, feathers are not a huge durability issue. The only time I would be concerned about a feather would be when it is of considerable size and reaches the edge of the girdle. If there is a “notch” on the girdle at the opening of the feather, I would be more concerned. The danger of the feather lies in the possibility that it might be hit a sharp blow on the girdle where the feather reaches it—such as on the edge of a car window, or a slip of the hand during setting. Since the atomic structure of diamond gives it perfect cleavage, it can be split along an atomic plane. Diamond cutters sometimes utilize this property when they “cleave” a diamond as opposed to grinding it. So, despite being the hardest natural substance known to man (meaning resistant to scratching) it is not “tough” the way gems with interlocking growth structure are. I would be more worried about a straight feather than a curvy feather, because the straight feather is most likely following a cleavage plane. I would also be more concerned if the straight feather (sometimes plotted as a “needle”) showed iridescence, because that would show the parting is wide enough to let in a little air. Feathers reaching deeply into the stone are more of a concern than shallow feathers. If the feather reaches deeply and breaks two surfaces of the stone I’d prefer to see it in an earring or necklace rather than a ring. If there are TWO feathers breaking the girdle that meet in the interior of the stone, and especially if they both break the surface, I would be concerned. When there are TWO feathers breaking the girdle that meet in the interior of the stone, and if they both break the surface, a blow in the right place could potential cut out a wedge from the diamond like a piece out of a pie. The main things to consider with durability issues are: can it survive setting, and can it survive wear. A careful setter and consideration of durability in choosing the setting can give the diamond better odds of survival. The other thing is that diamonds with dangerous feathers are the ones most often hidden or “Enhanced” by filling with a silica substance that makes them invisible—but no less dangerous. Sometimes dealers will promote their “enhanced” diamonds as a special (and sometimes “free”) service to improve the look of diamonds. Buyers should stay away from “clarity enhanced” diamond unless they understand exactly what is done in the “enhancement” process. It’s a “lipstick on a pig” kind of enhancement. Buyers should also understand that this type of clarity-enhanced diamonds are like underwear—there is NO trade-in or resale diamond. It’s a one-purchase market. Generally, feathers do not pose a durability risk during normal wear, but each stone must be judged individually. Multiple or precariously placed feathers may cause a risk, as mentioned in the expert responses above, but if a diamond has survived mining and faceting, then it is unlikely that a feather will worsen with wear. Regardless of feathers, diamonds can chip and certain shapes and proportions can create durability issues, so it is wise to wear your jewelry with care, and insure valuable pieces.